I think I had inadvertently arranged my Istanbul itinerary to be done in a somewhat reverse chronological order – my first day in Turkey was spent marveling at a collection of Istanbul’s modern art, tracing the remnants of the Occupy movement at Taksim Square and peeking into the life of the Sufis at Mevlevi Lodge. On the second day, I traveled further back in time to the tip of the Golden Horn, the coveted peninsula overlooking the Bosphorus, to witness centuries-old monuments that were once part of the Byzantine, Roman and Ottoman empires once gloried by their peoples. Here are four enthralling places you must not skip in the old quarters of Sultanahmet. 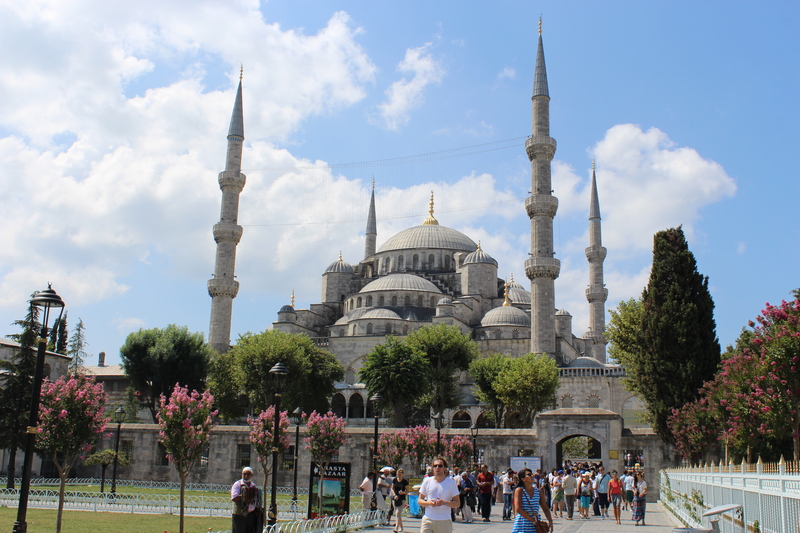 The grand mosques in Istanbul are a dud on the outside – the multi-dome design with four-cornered minarets is replicated throughout the city while it is painted in a dull and drab color, making them blend in too well with the surrounding buildings. The mosques do look impressive as it strongly stands out from afar but this was still a far cry from the many unique mosques I grew up to admire back in Malaysia. As it turns out, the character and identity of a Turkish mosque is elaborated on the inside by its many colorful adornments. Doesn’t look blue from the outside. Sultan Ahmet Mosque was completed in the year 1616 under the auspices of Ahmet I, on the site of a former Byzantine palace. 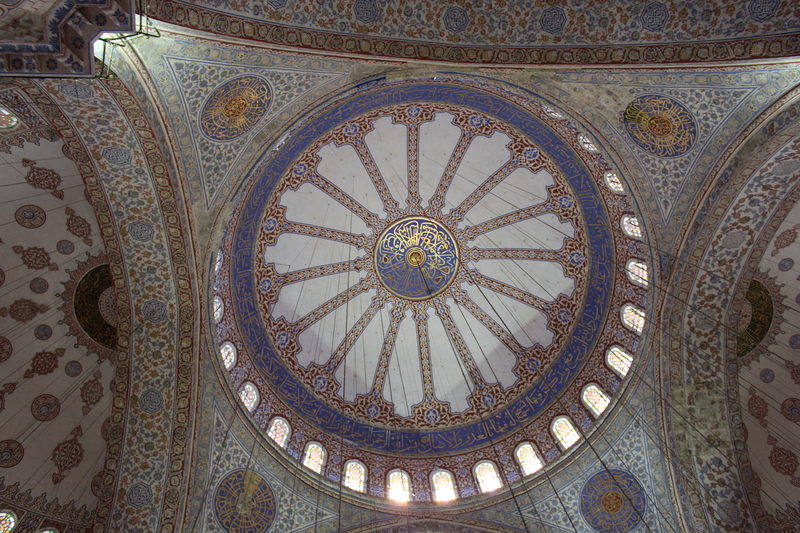 It gained the moniker of “Blue Mosque” due to the generous use of Iznik tiles on the interior of the mosque. Once in the prayer hall, I could not help but gaze at the intricate floral designs of the tiles and lines upon lines of Islamic calligraphy called “khatt” encircling the many domes of the mosque. Much thought and labor was put into creating this masterpiece that it could be still be enjoyed by people like me 400 years after it was built. Stunning and intricate design of the mosque’s interior. Right across the park lies Aya Sofya, a former Byzantine cathedral converted into a mosque after the Ottoman conquest in 1453 and now a museum. It looks like just another mosque from the outside with the main dome and minarets being the defining features but the mood totally changes once you step into its hallowed chambers. My senses were telling me that I am surrounded by Roman columns and marbled walls but each pillar had a banner with the name of “Allah,” “Muhammad,” or one the Prophet’s four khalifahs. A cathedral and a mosque. Away from the main hall, I wandered around the second floor of Aya Sofya to look for the mosaic murals crafted by the Byzantines throughout the centuries. 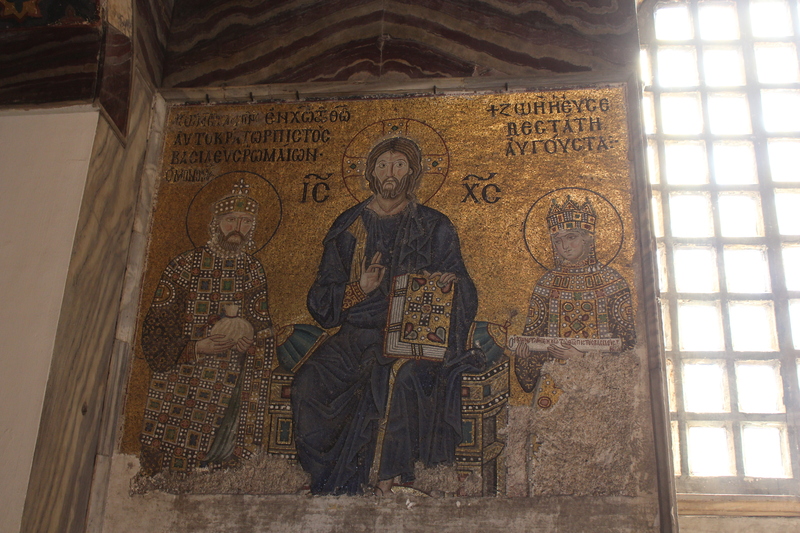 At first glance the murals look like paintings but a look closer showed that tiny mosaics were meticulously arranged on to form a visual canvas of Christ and other Byzantine luminaries. The gold mosaics that act as a background to the characters would glow a luminous hue upon contact with sunlight, creating an aura of awe to the unsuspecting onlooker. Another amazing Byzantine construction is the Basilica Cistern, a subterranean structure used as a reservoir for the city’s water supply. This out of sight cavern is not too far from Aya Sofya and it takes two full flight of stairs to descend into darkness. The water has been drained out up to the knee-level and walkways have been built for visitors to roam around the forest of pillars. I love how some sections of the cistern as poorly lit to create an atmosphere of eeriness, especially the route that leads to Medusa’s head. 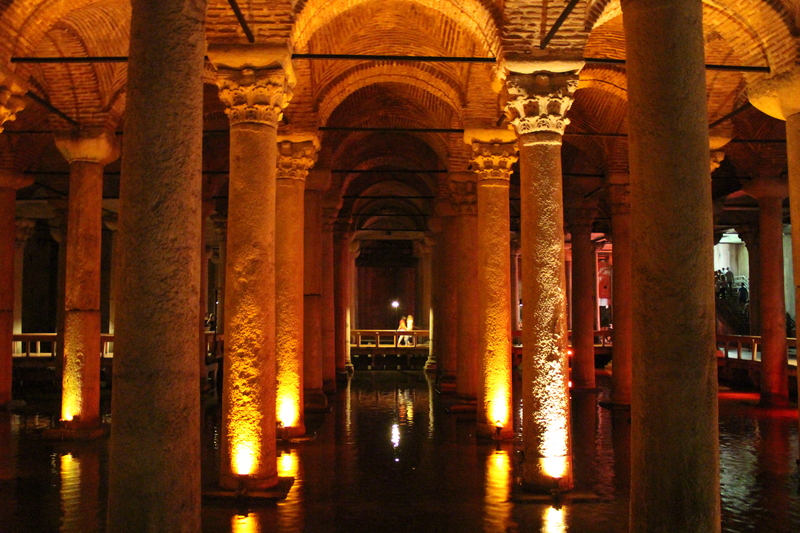 The eerie chamber of the Basilica Cistern. 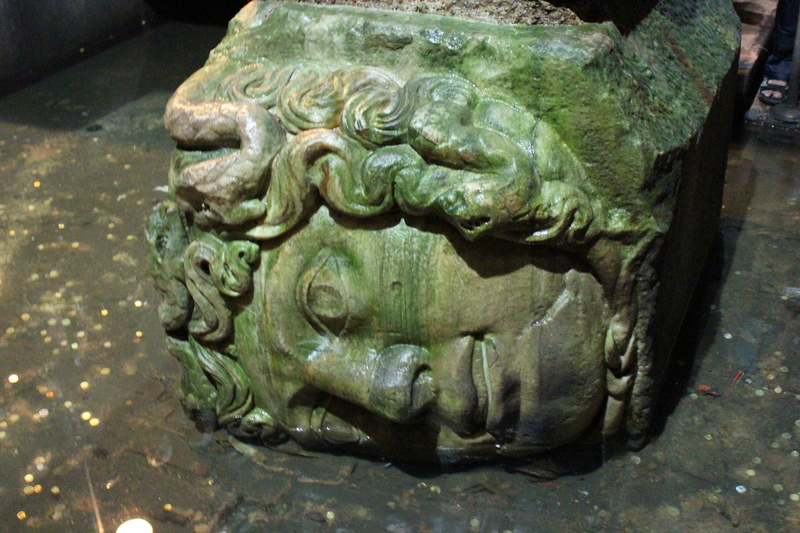 One of the far corners of the cistern holds two scary-looking Medusa’s Heads as column bases. These two heads were placed in an odd manner: one upside down while the other on its side. The two mysterious bases were theorized to come from a Roman building and were conveniently used to support the columns during the construction of the cistern. The Medusas creep the heck out of me and I couldn’t imagine how the maintenance crew back then would dread going down there. Not a good place for the maintenance guy to do his job. My final stop in Sultan Ahmet is the immense palace right at the tip of the cape. 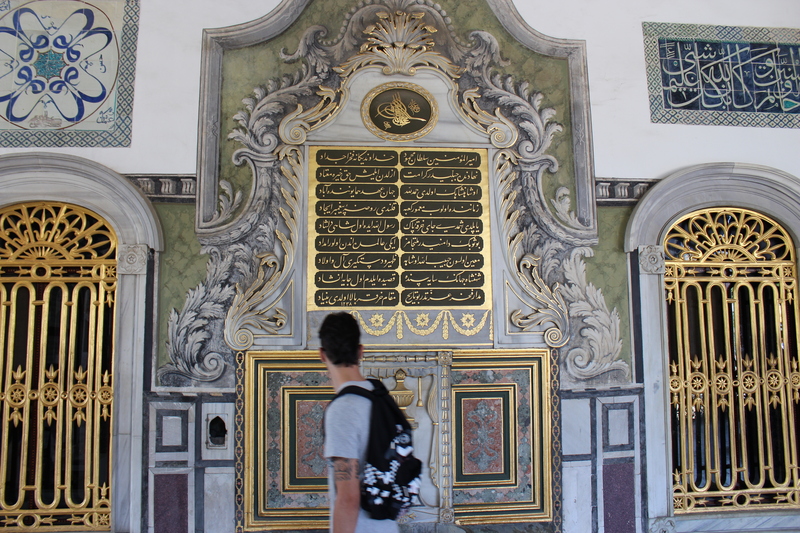 Topkapi Palace was used by the Ottoman emperors for about 400 years, consisting of sprawling courtyards mixed with gorgeously ornamented buildings and an equally large harem. The blue Iznik tiles feature prominently on the walls of the palace and I spent hours taking photos of the motifs on every nook and cranny. The best ones are reserved for the sultan’s and chambers but the tiles in the harem are just as beautiful as the royal rooms. Iznik Tiles adorning walls of the palace. There’s also a small gallery in the Privy Chamber where sacred relics of the Muslim world can be viewed like Muhammad’s cloak, Moses’ staff and Joseph’s turban. 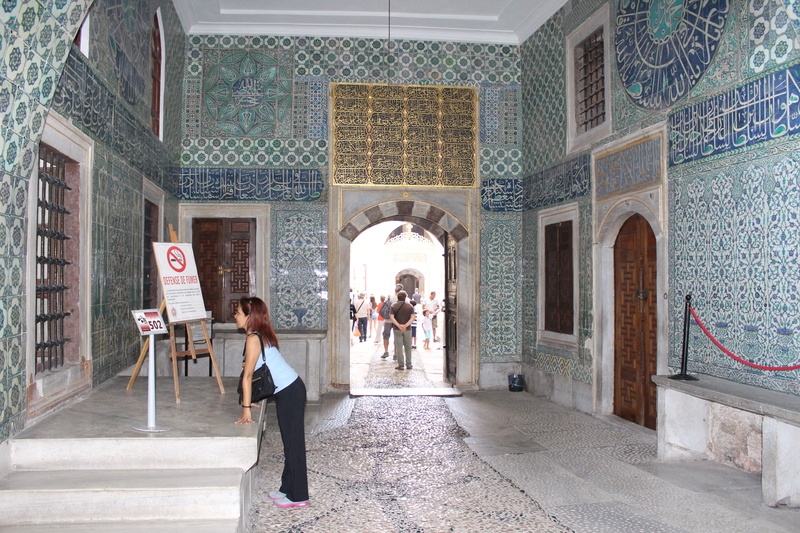 The Topkapi Palace is so huge that it takes 2 – 3 hours to cover the grounds so do make time to wander around the complex. I ended the day by lounging at the cafe overlooking the Sea of Marmara while snacking on the local combo of baklava and Turkish coffee. And that was the day my visual senses were rightfully overloaded with splendid architecture across the ages. Get lost in the sprawling grounds of Topkapi Palace and its Harem. Liat Masjid ni bikin pengen ke sana.